At Michael Farms, Food Safety is an integral part of our entire operation. It includes growing, harvesting, warehousing, packing and shipping. Our Food Safety Management System (FSMS) covers good agriculture practices (GAP), good manufacturing practices (GMP), employee training, supplier management, materials, and our entire farm and facilities operations. The goal of food safety is to protect consumers from unsafe or misbranded food. We implement procedures throughout our operations to anticipate and control any potential product hazards from harvest through distribution. Food Safety goes beyond a well designed, clean and well maintained facility, operated by skilled and trained personnel. It also covers record keeping standards for example, as well as product traceability, equipment calibration, testing and analysis, internal inspections and third party audits, supplier integration, and more. Food Safety is not a static program. It is dynamic in nature. It is important to us that Food Safety objectives not only fit comfortably into the overall objective of Michael Farms, but that they are also understood and easily executed by personnel at all levels. To ensure our food safety program is held to the highest standard, Michael Farms is audited and certified by Primus Labs, an independent, accredited organization that is internationally recognized as an industry leader in food safety. 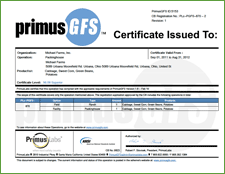 Michael Farms scored a superior level (the highest bracket) in both farm operations and packing facility operations under the new Primus GFS audit, which is among the most stringent standards in our industry category for food safety. Our managers receive continual training and education in food safety to develop and manage internal programs and to stay current with emerging trends and global standards.